CAConrad is the author of The Book of Frank, Advanced Elvis Course, Deviant Propulsion, and a collaboration with poet Frank Sherlock titled The City Real & Imagined. He is also a recipient of a Pew Fellowship in the Arts. Monkeybicycle: A Beautiful Marsupial Afternoon asks writers and non-writers alike to follow exercises or to make their own approaches to the “Soma(tic)”, which you define as a fusion between the tissue of our bodies and the inner divinity of our souls, our living, but I’m curious how much of this is truly intended as pragmatic instruction. Do you wish for A Beautiful Marsupial Afternoon to be read as a book of poetry, or as a book of practical exercises? CAConrad: I wish for total annihilation of everything preventing autonomy. Mb: In this way, A Beautiful Marsupial Afternoon seems almost to be less about presenting your poetry than it is about affirming or reaffirming the poet in all of us. Is this the intention of the book? CAC: In 2005 I found out a terrible truth. Where to start? When I was a child everyone in my family worked at the coffin factory in rural Pennsylvania. Coffins filled our lives. Beautiful coffins of all sizes and colors. I have seen so many coffins, and I’m certain that ALL of the coffins I saw as a boy in the factory are in the ground now, all over the world, filled with stinking, rotten corpses. I hated the factory. When it shut down and everyone worked in other factories I hated those factories just as much. My mantra growing up was, “I WILL GET OUT OF HERE I WILL GET OUT OF HERE I WILL GET OUT OF HERE I WILL GET OUT OF HERE! !” And I did get out of there. Or so I thought. In 2005 at a Conrad family gathering I discovered from listening to my family discuss their factory jobs that I WAS TREATING MY POETRY LIKE AN ASSEMBLY LINE!! I went home to Philadelphia in complete despair. Despair is the only real crime. And I came out of it when I made the decision to be completely PRESENT in my work. That I would create an extreme present environment in which to create my poems and to relinquish myself from the banal grind of the factory, and (Soma)tics are those. And A BEAUTIFUL MARSUPIAL AFTERNOON is a collection of some of those. But YES, to answer you, YES!! Everyone has a place at my table. A complete YES!! Mb: Throughout the collection you discuss a great deal of very specific knowledge, including the meaning of colors, the symbolic representation of scents, and the use of crystals. Is this information you’ve already gained and simply wrote about / from, or is there also a certain amount of research that went into creating this book? CAC: There is research, but I’ve always been researching. I’ve eaten dirt as research. I’ve learned about ancient alphabets, crystals, colors, and it gets to get used, all of this. Why not, right? There’s always more to learn. We can be ready for that fact, or be comfortable only knowing and doing part of the life we have. I want ALL OF IT!! Mb: A Beautiful Marsupial Afternoon opens and closes with detailed scans of your handwritten work, and so much of the book is concerned with getting away from the plague of technology, the absolutes of what is and isn’t based on tangible and often technological instruments. Is A Beautiful Marsupial Afternoon a “Luddite” text? Are you a Luddite poet? CAC: This is complicated. The destruction is HERE. We are in it, sitting in it, shitting and making love in it (some of my friends shitting and making love simultaneously). It’s only going to become more and more disgusting here on earth until we surrender to the harrowing truth that we are human. The extraterrestrials who have been visiting us have let us know how harrowing. Mb: In the appendix to A Beautiful Marsupial Afternoon you highlight some of the (Soma)tic Poetry Workshops you’ve already conducted, and I’m interested to know if these workshops will continue as a staple of your future, a form you play and replay in more cities around the world, or will it diminish if your next book is not focused on a purely (Soma)tic approach? CAC: The most wonderful opportunities are yet to be known. Workshops are a place where we create together because (Soma)tics are an experiential process that anyone can be part of frankly. Sometimes dancers show up. They dance while others write, and even now painters who paint instead of write. It’s pretty terrific. My first book didn’t come out until I was 40. By the time I was 35 I thought, “Oh, well, maybe I’ll never have a book published.” But it didn’t stop me. I’m not stopping. I have poems to write up to my last breath. I have (Soma)tic designs for writing poems while on chemotherapy if it comes to that. Yes. It’s a good thing to not know WHEN we will die. But it’s also a good thing to know how to meet it with the utmost and I mean TOTAL sense of revenge!! Creativity is our only true revenge. Being creative is the revenge against all the bastards trying to break the spirit of our fellow humans. We will meet it all, together, and no other way. Fear is not an option, is not even capable when we meet it all, together. 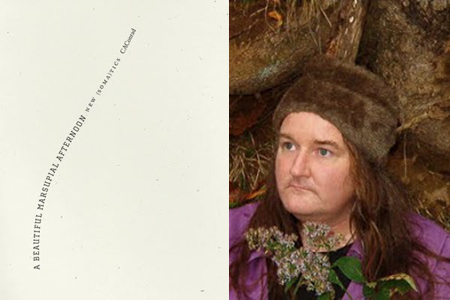 Purchase a copy of A Beautiful Marsupial Afternoon here, & read more from / about CAConrad here.